This study was performed to evaluate hospital-acquired renal insufficiency with special reference to the causative factors, clinical course and patient management. A total of 100 patients who were admitted to medical and surgical wards at the King Hussein Medical Center, Amman, Jordan over a 15-month period and who developed renal failure during their hospital stay, were referred to, and seen at the nephrology department. The patients ages varied from 18 to 77 years; there were 59 males and 41 females. Reduced renal perfusion, major surgery and administration of nephrotoxic drugs accounted for the majority of episodes of renal failure (77%). In general, non-oliguric patients fared better, they required dialysis less frequently and had lower mortality compared to the oliguric patients. Severity of renal failure and multi-organ involvement adversely affected the prognosis. However, age of the patient had no influence on the outcome. A prospective field study was conducted to determine the prevalence rate of cryptorchidism, hypospadias and other genital disorders in school children in the eastern part of Jordan. A total of 2495 school boys from 10 different schools were examined in May-June, 1995. Standardized examination and classification criteria were used. Two general practitioners and two pediatricians carried out the study. The various genital disorders detected during the screening were as follows: Undescended testis, 1.96%; Inguinal hernia, 0.80%; Varicocele, 1.08%; Hydrocele, 0.52%; Hypospadias, 0.92%. The prevalence rates of genital disorders in this study were similar to those reported by others. Early recognition and treatment of genital disorders in school children is mandatory in order to prevent potentially adverse effects. Between the years 1984 and 1993, a total of 72 female patients underwent endoscopic suspension of bladder neck for treatment of stress urinary incontinence at the King Hussein Medical Center and Hamad General Hospital, Amman, Jordan. The age of the study patients ranged between 32 and 75 years (mean: 46.5 years). Fifteen (20.8%) had history of previous operations for incontinence. The overall success rate achieved was 93.1%. Post­operative complications were encountered in seven (9.8%) patients within follow-up period of 4 to 43 months. Treatment failure occurred in five patients (6.9%). Our experience further confirms that endoscopic suspension of the bladder neck is a simple and reliable procedure in the treatment of female stress urinary incontinence. Cyclosporine is used as an immunosuppressive agent in organ transplantation. It has several side effects including gingival overgrowth. We evaluated 30 renal transplant patients on cyclosporine for the degrees of the gingival overgrowth. All the patients were males with mean age of 37.5 years. Eighteen patients (60%) had moderate to severe degrees of gingival overgrowth. No correlation was found with the trough levels of cyclosporine in blood. We conclude that gingival overgrowth is associated with cyclosporine immunosuppressive therapy but may not be dose related. The effect of other factors such as dental plaque and oral hygiene should be further studied. Mismatching for HLA antigens in renal transplant recipients effects the graft survival and may also be responsible for the development of malignancy including skin cancer due to the intensive immunosuppression, continuous antigenic stimulation or both. In this article, available data are reviewed and an attempt is made to show that some specific immunologic and immuno-genetic factors like the HLA system also play a role in the development of skin cancer in renal transplant recipients. A 17-year old Saudi male presented to the transplant clinic of the King Fahad National Guard Hospital, Riyadh two weeks after undergoing a living unrelated kidney transplant in India. Graft function was normal and routine urine culture grew Pseudomonas aeruginosa for which he was treated; a follow-up urine culture was negative. Five months later, routine urine culture again documented the presence of Pseudomonas while the patient continued to be asymptomatic with normal graft function. Abdominal ultrasound showed shrunken native kidneys and a normal graft. 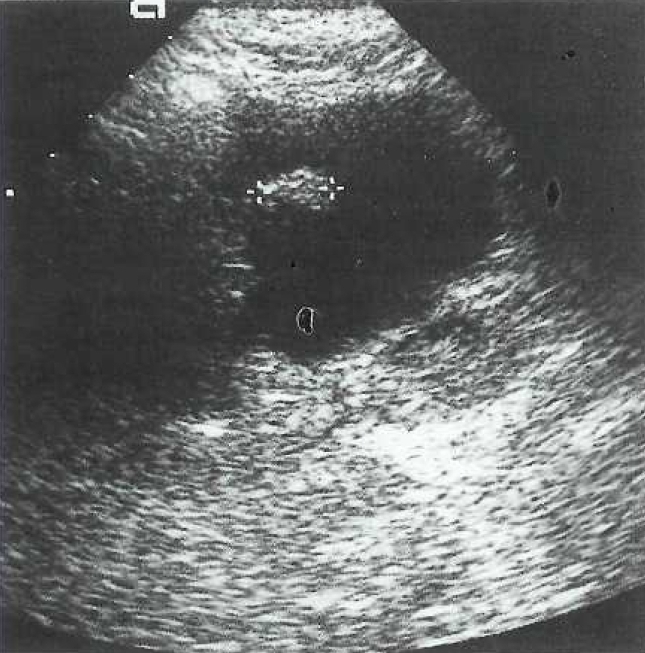 A slightly echogenic mass was detected in the bladder. Cystocopy showed a retained non­absorbable suture at the area of the uretero-vesical anastomosis. Cystoscopic removal of the suture was carried out following which urine cultures have remained persistently negative. Acute oliguric renal failure (ARF) developed in a patient two weeks after he was started on intermittent anti-tuberculous therapy including rifampicin. The clinical picture was compatible with acute allergic interstitial nephritis. Renal histology revealed mainly acute tubular necrosis with mild tubulo-interstitial mononuclear cellular infiltrate. Intermittent therapy, as in our patient, has been the major factor in the development of rifampicin induced ARF in cases reviewed in the literature.